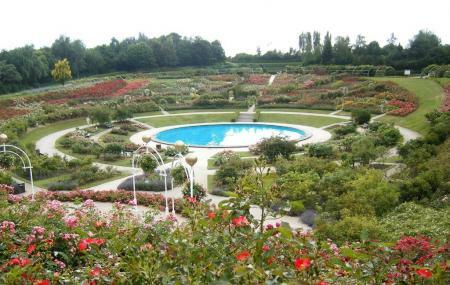 La Colline aux Oiseaux is a 17 hectare park with a rose garden of over 15,000 roses divided among 570 species. Some of these have been there from the middle ages. Yew and boxwood maze, French towns garden and twin towns’ garden are some of the features of the place. Perennial plant garden, the wildlife parc, Normandy in miniature are all the other things tourists get to see here. In addition there is a children’s play area. There are floral test gardens, Minigolf course and tearoom for spending quality time. There are guides who take groups on tour of the place. Guided tours are available on appointment. Restaurant l 'athena, Global express cafe. How popular is La Colline Aux Oiseaux? People normally club together Bayeux Tapestry Museum and Chateau Ducal while planning their visit to La Colline Aux Oiseaux. A very pleasant experience here . A lovely place to discover . A beautiful garden near the Mémorial de Caen museum. There's a large free parking lot nearby. A beautiful place to take a break and go for a walk. There's a restaurant nearby outside the gardens which I have reviewed separately. Wonderful green area! And mostly I like the idea behind it's story. This place was desastrous and most of Caen's city trash was dumped and burned here from 1923 to 1973. It was gradually transformed into a wonderful scenery parc with several small animal and bird zoos. It is idealfor kids and families.